This drawing is in indian ink and coloured inks on paper. What I try and do in drawings like this is to convey to the viewer what it was that made me look at the building in the first place. What was it that struck me when I first saw it? In this case it was the way it stands above and dominates the village and the village green. This is why I have shown it as a lofty building and by making the tower smaller have exaggerated the distance from the chancel back to the tower. Whilst it is a very decorated building parts of it are nevertheless derelict. Making the broken down parts very evident adds a poignancy to the image and suggest a less than peaceful history. 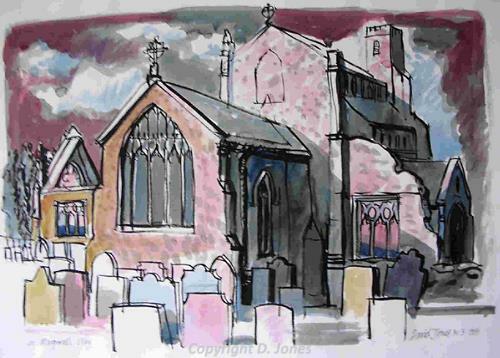 David has also been inspired by St Nicholas' Church, Blakeney and Salthouse.